A woman shouts slogans during the Women's March in New York City, January 20, 2018, as protestors took to the streets en masse across the United States. It was a sign of lasting outrage, coming a year after the first women's marches following President Trump's inauguration. 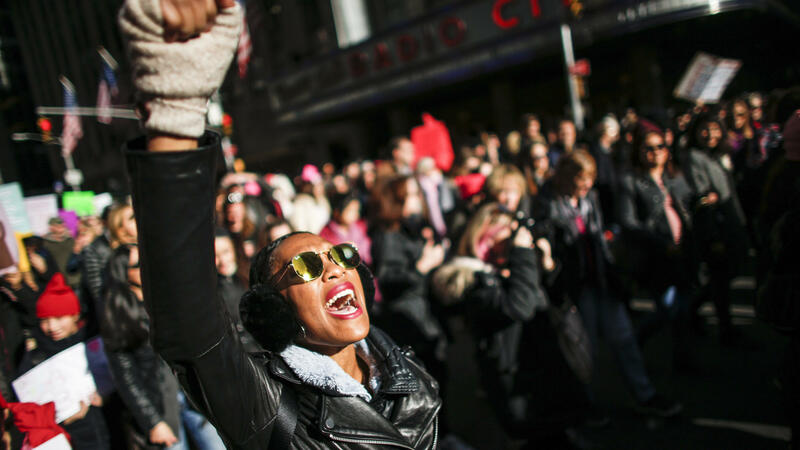 More than a year and a half ago, the day after Donald Trump was inaugurated, millions of women worldwide took to the streets in fury over his election. It was a massive show of resistance — likely the largest protest in U.S. history, as the Washington Post reported at the time. One of the biggest questions that loomed over the demonstrations that day: could the energy last? Amy Chomsky, an ophthalmologist from Nashville, attended the demonstration in Washington, D.C., and she wanted to make it clear that she and her fellow marchers were serious in their anger. "We're not just crazy protesters," she said the day of the march. "It's a shame that we have to still be fighting for women's rights or saying that we have a right to decide on our own reproductive health. We have a right to equal pay. It's a shame that we're still doing this." And for Chomsky, that energy has lasted, making her more politically active than ever before. "I really in the past was kind of like, 'Eh, the right person will win, I'm sure,'" she told NPR last month. "I voted probably in several presidential elections. I rarely voted in either local or midterm and things like that. Now I really try to vote on all of those." In addition to that, she says that for the first time she has yard signs, is making political donations, and helping put on a fundraiser for a Democratic Senate candidate. And that makes her a prime example of the surge in energy among Democratic women this year. "What you're seeing is just this harmonic convergence where women are running, women are volunteering in campaigns, women are making record numbers of contributions," said Celinda Lake, Democratic pollster. "And women are voting for Democrats, especially women Democrats." A record number of women have run and won primaries for the U.S. House, U.S. Senate, and governorships this year, according to the Center for American Women and Politics at Rutgers University, and a record number of women have also won nominations for state legislatures; the vast majority are Democrats. In that sense, every year is the "year of the woman." But in 2018, polls show women have swung even more Democratic than usual, while men remain nearly evenly split, or leaning slightly Republican. According to an NPR analysis of recent likely-voter polls, this year's gender gap could be even bigger than those in 2014 and 2016, with women far more Democratic than in either of those years. "Republicans heading into the midterm need to be concerned about the gender gap," says Republican pollster Christine Matthews. That larger gap may be here to stay, Matthews says, in part because it's inseparable from other longer-term political trends. "Whereas the Republican Party used to primarily be comprised of college educated voters, college educated voters — particularly college educated women — have been becoming more Democratic," Matthews said. "What happened is the 2016 election sped that up." Among the most energized of Democratic voters are women of color, says Aimee Allison, president of Democracy In Color, a group that does multiracial organizing among progressives. "We have the possibility of women of color for the first time getting recognition for Democratic Party successes out of the midterms, and people taking a good look at those numbers and saying, 'Oh my goodness, women of color made the difference,'" she said. In particular, Black women have relatively high turnout rates, and they vote heavily Democratic. Black women in Alabama propelled Democrat Doug Jones to a Senate seat — a remarkable political upset — in a December special election, and they also helped push Ralph Northam to a win that was larger than predicted in most polls in his 2017 election for the Virginia governorship. In Allison's opinion, that kind of energy among progressive voters of color — especially women — should be enough to get some Democrats who might be tempted to see moderation as a winning strategy to change their minds. "I don't know how many losses political consultants need to have in order to say we're going to stop chasing Trump voters, or white moderates, and start looking at the math that says we actually don't need them in order to win," she said. "The new coalition that is part of the playbook includes white voters, but it doesn't center on trying to attract moderate white voters," she added. While many women are swinging Democratic, women who supported Trump when he first took office stuck with him over the long term. Women voters who voted for Trump largely maintained their "warm" feelings toward him as of March 2018, according to an August study from the Pew Research Center. Cindy Moser is one woman who has stuck with the president. The retired teacher from North Carolina attended Donald Trump's inauguration, and she stressed then that she's not alone in being a woman who supports Trump. "I was on his train from day one," she said then. "One by one, all my family and friends hopped on. My mother was the worst. Now she looks at me, she says, 'I told you he was going to be good.' I just have to laugh." And she's still on that train. "I absolutely adore him," she told NPR recently. Moser added that she doesn't really empathize with women who dislike Trump. "I've always been a strong woman. If I wanted something I found a way to get it. Nobody has stopped me," she said. "It's just the way I am. I don't feel victimized by Trump." That sets Moser apart from many American women, 62 percent of whom disapprove of Trump, and half of whom strongly disapprove, NPR and Marist found in a recent poll. And that may affect how they vote in November. For her part, Amy Chomsky is hoping that means they'll vote. "I think this is a pivotal time," she says. "I just feel like we need to get as much Democratic vote as we can. And I think the more people who can get out and vote in these midterms is gonna make a difference." And that intensity is coming from a woman who doesn't remember voting in a midterm before. The midterm elections are remarkable in part because a record number of women are running for office. But when it comes to voting, women have outnumbered men in every national election for more than half a century. So you could say every year is the, quote, unquote, "year of the woman." As NPR's Danielle Kurtzleben reports, the difference in 2018 is how female voters are galvanized against the party in power. DANIELLE KURTZLEBEN, BYLINE: On Donald Trump's first full day in office, millions of women worldwide were out in protest. UNIDENTIFIED PEOPLE: (Chanting) Nasty, nasty girls - we're here to march. Whoo, whoo, whoo. KURTZLEBEN: Amy Chomsky, an ophthalmologist from Nashville, was at the Women's March in Washington, D.C.
AMY CHOMSKY: We're not just crazy protesters. Again, it's a shame that we have to still be fighting for women's rights or saying that we have a right to decide on our own reproductive health, we have a right to equal pay. It's a shame that we're still doing this. KURTZLEBEN: One big question then was whether the energy behind the marches could last. For Chomsky, it did. Here's what she said last month. CHOMSKY: I really in the past was kind of like, the right person will win, I'm sure. I rarely voted in either local or midterm and things like that. Now I try to vote on all of those. KURTZLEBEN: She also says that for the first time, she has yard signs and is making political donations. CELINDA LAKE: What you're seeing is just this harmonic convergence where women are running, women are volunteering in campaigns, women are making record numbers of contributions. KURTZLEBEN: That's Democratic pollster Celinda Lake. She says Donald Trump played a big part in energizing Democratic women to run and to organize. Many Democratic women were furious that Trump got elected over Hillary Clinton despite multiple allegations of sexual assault against him. That issue has returned now with the allegations of assault against Supreme Court nominee Brett Kavanaugh. And since 2016, women have swung far towards the Democrats. CHRISTINE MATTHEWS: Republicans heading into the midterm need to be concerned about the gender gap. KURTZLEBEN: That's Republican pollster Christine Matthews. A recent NPR-Marist poll found a big gap when you ask which party's candidate a voter would prefer in Congress. Men preferred a Republican by six points. Women preferred a Democrat by 28 points. And that big gap may be here to stay, Matthews says. MATTHEWS: Whereas the Republican Party used to primarily be comprised of college-educated voters, college-educated voters - particularly college-educated women - have been becoming more Democratic. What happened is the 2016 election sped that up. KURTZLEBEN: Among those most energized are nonwhite women, says Aimee Allison, president of Democracy in Color. AIMEE ALLISON: We have the possibility of women of color for the first time getting recognition for Democratic Party successes out of the midterms. KURTZLEBEN: Black women propelled Alabama Democrat Doug Jones to a Senate seat last year. In light of that, Allison believes that some Democrats are now rethinking their campaign strategies. ALLISON: I don't know how many losses political consultants need to have in order to say, we're going to stop chasing Trump voters. The new coalition doesn't center on trying to attract moderate white voters. KURTZLEBEN: Meanwhile, many Republican women say they are being overlooked, and they have largely remained loyal to the president. Cindy Moser, a retired teacher from North Carolina, attended Trump's inauguration. CINDY MOSER: I was on his train from Day 1. One by one, all my family and friends hopped on. KURTZLEBEN: And Moser told me recently that she's still on that train. MOSER: I absolutely adore him. KURTZLEBEN: Still, 62 percent of women voters disapprove of President Trump, NPR and Marist found, and 52 percent strongly disapprove. For her part, Amy Chomsky is hoping that means they'll vote. CHOMSKY: I think this is a pivotal time. The more people who can get out and vote in these midterms is going to make a difference. KURTZLEBEN: And that's coming from a woman who doesn't remember voting in a midterm before. Danielle Kurtzleben, NPR News, Washington. (SOUNDBITE OF KEV BROWN'S "LOOK") Transcript provided by NPR, Copyright NPR.